Editor’s note: This is the fourth in a series of faculty profiles highlighting the diverse and innovative faculty at UCCS. Christopher Bell grew up with friends living on the same block, attending the same schools and going to the same events, but they all turned out to be vastly different as adults. “Different careers, different lives. But also completely different ways of seeing the world, which makes me wonder how they could see it the way they do when we all basically came from the same places and spaces,” Bell said. His curiosity turned into a career. 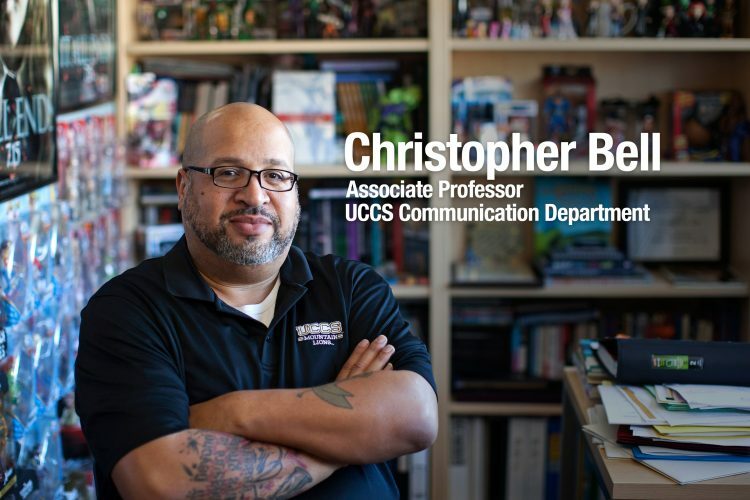 As an associate professor of media studies at UCCS in the Department of Communication, he studies how popular culture influences the adults we become. 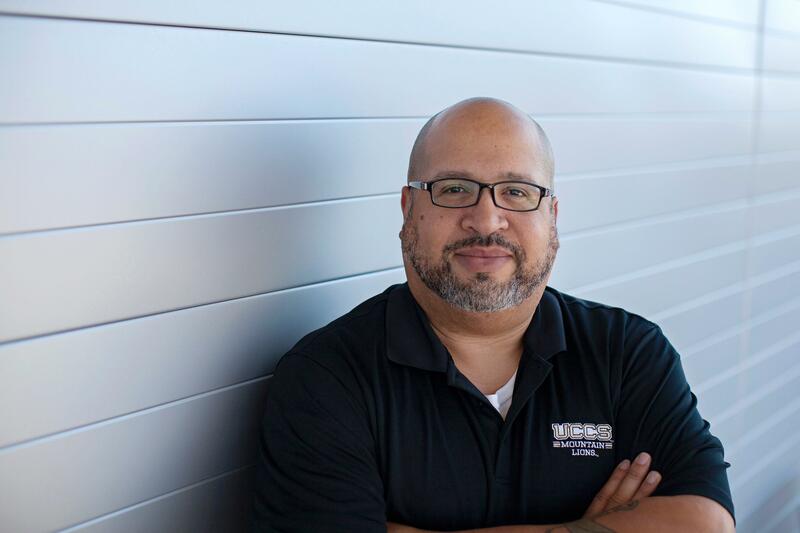 He specializes in how race, class and gender are reflected in children’s media. Toys, books, TV shows, movies and music have embedded messages, teaching kids about themselves, the world and their role in it. Bell, who joined UCCS in 2010, wanders toy aisles researching how gender is reflected on shelves. He’s upset by what he often hears like kids being told a boy can’t get a doll because it’s for girls or that girls shouldn’t play with trucks. He’s sometimes surprised this is his life. In high school, he thought he’d design wedding dresses. He spent the early years of college adrift, dropping out of four schools, switching majors seven times. “If today I knew me when I was going through all of that, I would be like, ‘I don’t know if that kid is going to make it.’ It was a rough road for me,” Bell said. A history professor changed everything. His junior year at the University of Northern Colorado, Joan Clinefelter became his mentor, often checking in with him. It was the first time he felt someone at the school truly cared about him. Clinefelter sensed Bell needed to connect with someone, so she reached out. He flourished. 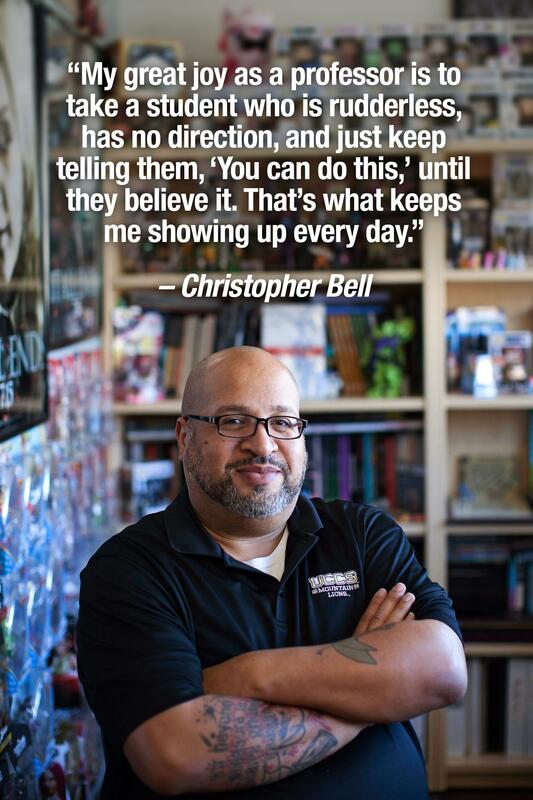 Bell received a bachelor of arts in social sciences in 1998 from UNC; a master of arts in television, film and new media studies in 2000 from San Diego State University; and a doctorate of philosophy in mass communication in 2009 from CU-Boulder. Bell, who is also director of graduate studies, still keeps in touch with Clinefelter 20 years later. He tries to repay what she did for him. Bell guided M.J Arjomandi through graduate school to becoming a UCCS communication instructor last year. Arjomandi was hooked when Bell give a guest lecture on how “The X-Men” serve as social commentary for the civil rights movement. Bell challenged him more than ever academically. When Arjomandi became a graduate teaching assistant, Bell helped him learn his way around the classroom. Bell hopes his work helps fade out the idea of “toys for girls” and “toys for boys.” Labeling them teaches children forced gender roles, shaping how they see themselves and others. It can create a culture that leads to bullying—or worse. Bell tells the story of a Florida boy who attempted suicide at age 11 after schoolmates repeatedly ridiculed him for liking “My Little Pony.” He suffered extensive brain damage. His research shifted more to gender when he became a father. He wanted insight into the world his daughter would be navigating. Now 11, she’s always encouraged to express herself through play. A fan of “Star Wars” and comic books such as “Guardians of the Galaxy,” she enjoys playing both female and male characters. But Bell could hardly find any female superhero stuff for her a few years ago. Today, it has more than 1 million hits, and female superhero merchandise abounds. “I like to think I made that happen in some small way,” said Bell, whose office is filled with 200 toys, many of which are female superheroes.